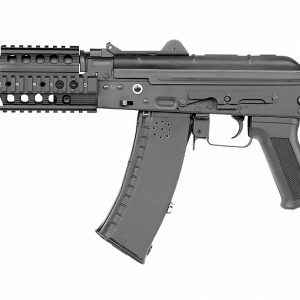 AK BM HAMMER is made from real deactivated combat AK 105 assault rifle. So please advice about the lawfulness of using deactivated firearms in laser tag games in your country before purchasing. When manufacturing the line of models made from AK 105 deactivated bodies, we used our latest PBS-1L optical lens tube, which is the exact replica of the original PBS-1 silencer for Kalashnikov rifles. The optical Lens tube is made from plastic that has excellent durability. The low weight of the lens tube makes this Kalashnikov laser tag gun well balanced. We use drum-type magazine instead of its common box magazine. Speaker is located in the magazine. Sounds are powerful and excellent quality. Optimal fire range and battery life are common to all Kalashnikov laser tag models.